ILS, a U.S.-based, global, commercial launch services provider, and UK-headquartered Effective Space have issued information regarding the intent to contract to deliver two of Effective Space’s SPACE DRONE™ spacecraft into orbit — the Proton Breeze M rideshare launch is planned for 2020 from the Baikonur Cosmodrome in Kazakhstan. 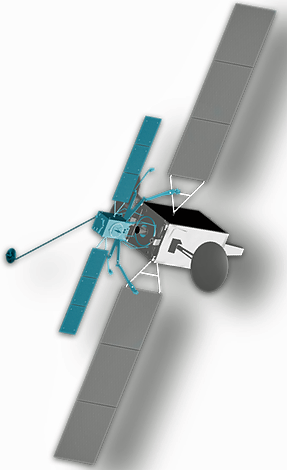 The ILS Proton Breeze M vehicle with the standard 4 meter payload fairing will launch the two spacecraft into a geostationary orbit. The SPACE DRONE™ spacecraft will then use their onboard propulsion system to maneuver to their contracted life-extension mission locations, as recently announced. 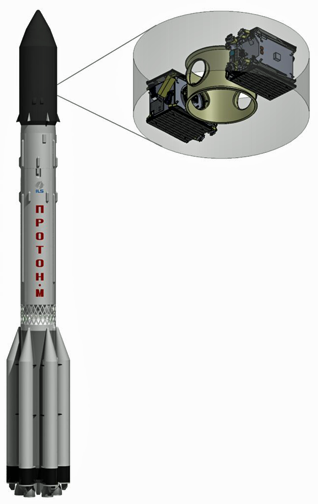 The ILS Proton Breeze M vehicle will launch the SPACE DRONE™ spacecraft into a geostationary orbit in 2020 from the Baikonur Cosmodrome. Image is courtesy of Business Wire. ILS Photon Breeze M liftoff. The SPACE DRONE™ spacecraft is a 400 kg. spacecraft (1m x 1m x 1.25m) that has a universal, non-intrusive docking system to rendezvous and dock to the geostationary host satellite. The SPACE DRONE™ spacecraft then uses electric propulsion to take over the station-keeping and attitude-control maneuvers of the joint stack. Missions include station-keeping, relocation, de-orbiting, orbit correction, inclination correction and ‘bringing into use’ (BIU). The ILS Proton Breeze M launch will be the first deployment of Effective Space’s SPACE DRONE™ spacecraft in 2020. Planned fleet expansion will see as many as six (6) SPACE DRONE™ spacecraft being sent to orbit on an annual basis. Future phases will see SPACE DRONE™ spacecraft being launched to support LEO constellations, Active-Debris-Removal (ADR) and other logistics in space. Artistic rendition of Effective Space's SPACE DRONE™ spacecraft. 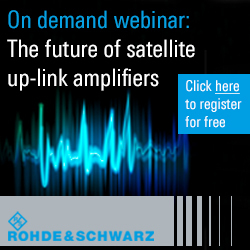 ILS President Kirk Pysher said that the company is focused on serving the satellite industry with flexible, and affordable launch solutions. This agreement with Effective Space is a perfect example of that goal. The performance of the Proton Breeze M vehicle to deliver the SPACE DRONE™ spacecraft directly to geostationary orbit combined with the firm's decades-long history of launching dual or multiple spacecraft simultaneously makes these missions a natural fit for Proton to deploy their spacecraft. This combination of performance and experience will enable Effective Space to realize their mission objective in the most expedient and effective way possible. Arie Halsband, the founder and CEO of Effective Space, reported that launching the company's first two SPACE DRONE™ spacecraft into a geostationary orbit is part of Effective Space's strong commitment to the firm's first customer, meeting mission timeline and ensuring smooth transition into a life-extension service. Due to the attractive economics, extending existing assets in space is something that is gaining significant traction in today’s market. 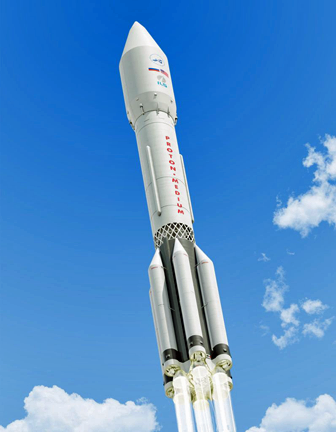 With that in mind, the announcement of this launch, using the performance of the Proton Breeze M vehicle, is an important milestone for a rapidly developing market. ILS worked with the company to arrive at a reliable, high performing, cost-effective solution for this business. The Proton Breeze M vehicle has launched 416 times since the rocket's maiden launch in 1965, which started out as a two-stage vehicle. For ILS, there have been 96 missions to date since the launch vehicle's debut with the launch of the Astra 1F communications satellite in 1996. Proton Breeze M has a lift capability of 6.3 metric tons to reference GTO and more than 3 metric tons to GSO; the Proton Breeze M has the versatility to launch single, dedicated missions as well as dual or multiple spacecraft with either the standard 4.35 meter payload fairing or the larger 5.2 meter diameter payload fairing.